Marathon Motors “BCP” motors, equipped with grounding rings, assures successful operation with Variable Frequency Drives without sustaining bearing damage due to inverter-sourced bearing current. 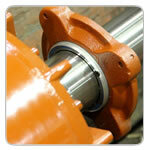 Our “Bearing-to-Bearing” guarantee includes bearing replacement for the duration of the standard warranty period. For Marathon Cooling tower motors with BCP, see this brochure. For a mini-catalog containing all Marathon motors with BCP, see here. Or you can find their full 2014 catalog here. Marathon News Release: Field Installable Shaft Grounding Ring Kits.